Paul Pogba has revealed he found it difficult to play under United’s old tactics and hinted he is happier now the Reds are focussing on attacking football under Ole Gunnar Solskjaer. Pogba provided a superb pass to set up Marcus Rashford for the only goal of the game as United beat Tottenham 1-0 at Wembley on Sunday, helping the team win for their sixth game in a row since Solskjaer replaced Jose Mourinho in December. And the France international has been a player reborn under the Norwegian, playing seemingly free of the shackles that had hampered him during the difficult final days of Mourinho's reign. 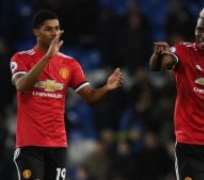 The win at Wembley dragged United to within six points of the top four, a target that looked virtually out of reach just a few weeks ago when the team lost 3-1 at Liverpool . “I love playing big matches and against the best players,” said Pogba after the game. “That's where we improve and progress. It was a big one for us. Everyone played well. “I'm enjoying playing football. It was really difficult with the tactics we used to play. I like to play more attacking. Defending is not my best attribute. “The manager told me to get in the box, get goals. My best example is Frank Lampard, he's the one who makes those runs. United had goalkeeper David de Gea to thank for preserving their lead at Wembley, with the Spanish goalkeeper making a succession of stunning saves in the second half to shut out Spurs and seriously dent their title aspirations. But Pogba too made an invaluable contribution, leading by example as the team continued their remarkable revival since Mourinho was put out of his misery following defeat at Anfield. “It's a great ball,” said Pogba of his contribution to Rashford's first-half strike. “But we've been training on this. We knew that was the weakness of Tottenham. We needed to attack on the opposite side, that's what we did and we scored a goal. We knew it would be very difficult, we knew we could hurt them on the counter.